Now that L is getting a little older, J and I have been wanting to start traditions. At this age, their more for us than for her, but we want her to always remember doing certain things. 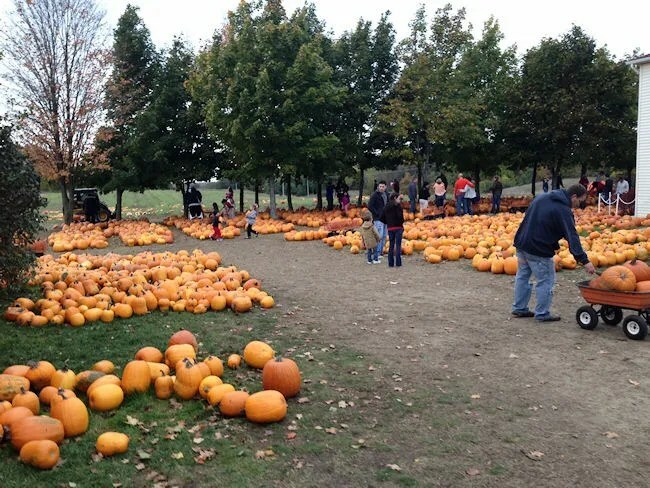 One of the fall tradition for most families is pumpkin picking. Last year, we went to a place in Illinois that J went to as a kid. It wasn’t a lot of fun because it was so crowded. Now that L can walk around and explore, we decided to head to the pumpkin patch that everyone in Kalamazoo knows. 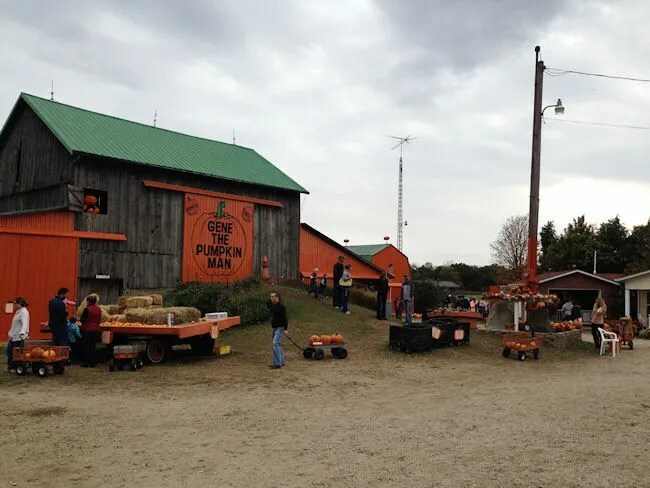 Even if you’ve never been to Gene The Pumpkin Man’s, you know exactly where it is if you’ve ever driven down M-43. There’s a large barn with a big orange door visible from the road. Even the mailbox is orange as is almost everything else on the property. There have been several times that I’ve seen Gene in Meijer in the spring (or anytime of the year actually) wearing his trademark bright orange shirt and cowboy hat. When you pull in to the property, there’s a makeshift parking lot in a field on the east side of the property. While there were several cars packed in to the field, the farm was not busing at the seems and that made us happy. We found a parking spot near the front of the parking lot then got everyone out of the car and walked up to the farmhouse. 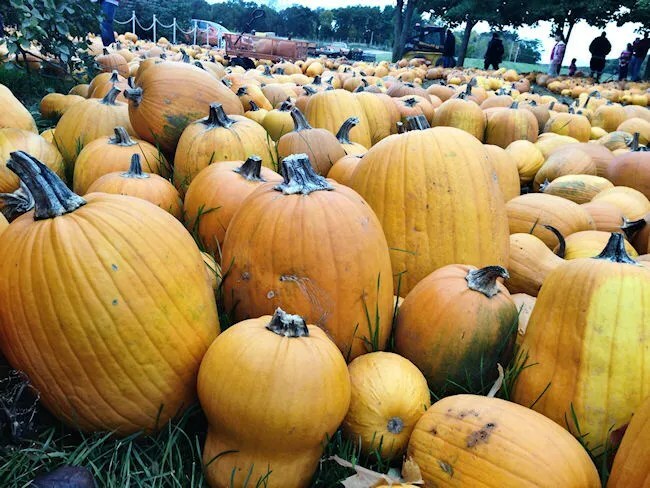 There are pumpkins all over the property. The bulk of them are lined up around the house. 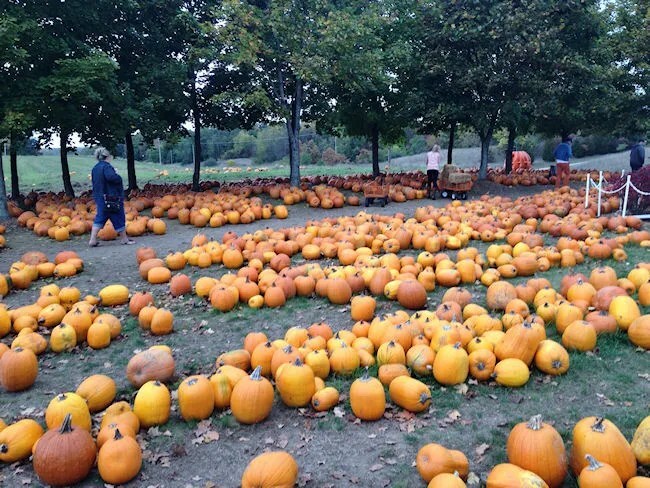 This is where you’re going to find the carving pumpkins. 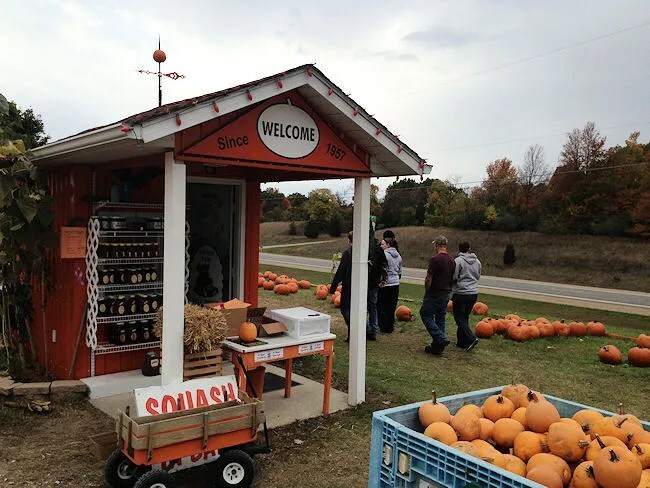 There are other bins located on different parts of the property….some in a barn…others just out in the open where they have pie pumpkins, gourds and special pink pumpkins. We overheard Gene telling someone that his wife passed away from cancer (and the garage is a little shrine built for her) and his daughter is a cancer survivor…so that’s why he has the pink pumpkins for sale. The first thing we found was a flatbed trailer with little pumpkins. We tried to make L happy early on and let her pick out and carry around a pumpkin that was her size. We then wanted to try taking some pictures in the hay barn. We thought it would be a good backdrop, but L was more interested in climbing on the hay instead of posing for pictures. After a quick stop in front of the big sign to take a family picture, we spotted some cows grazing in a pasture. Once L saw them, she went over to say high. She really wanted to hug the cows, but they were too busy eating pumpkins..and it wasn’t a petting zoo. I asked her to say “bye-bye” to the cows and she did. We then went to pick out a pumpkin. We went back up the trail to the house where there were just rows and rows of pumpkins. L started to pick up a few, but really didn’t want us taking her picture as we were trying to do. Eventually, L went to Grandma and they started climbing a tree which made her happy while J picked out the perfect pumpkin. It started to sprinkle a little bit so we started to head back to where Gene was sitting to pay for our pumpkins. There was a little line and we actually ended up paying a different lady and didn’t get to interact with Gene. The pumpkin, the little pumpkin L had in her hand, and a pumpkin knife with the Gene The Pumpkin Man logo on it cost only $6.50. I thought at first she was only charging us for the big pumpkin, but she said nope…she had everything. 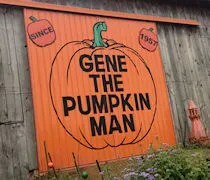 Gene The Pumpkin man has a great little place that will most definitely become a family tradition for us. The prices were incredible and the whole atmosphere of the place is that of a little family farm…which is exactly what it is.